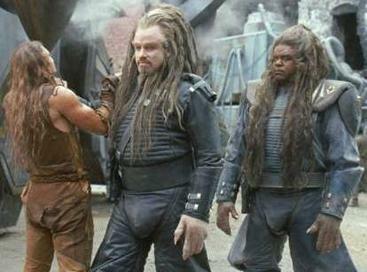 "Battlefield Earth" is a corny science fiction film starring John Travolta as we never seen him before. Don't expect any dancing or hits by the Bee Gees in this production! Instead, we are transported to a dystopian future in which Earth has been conquered by an alien breed of monstrous sociopaths with a terrible sense of humour, and a language that makes Klingon sound like Classical Greek. The completely illogical plot is based on a novel by L Ron Hubbard, the founder of Scientology. I never read the novel, but the movie version contains no overt or covert references to Hubbard's controversial philosophy. I found this somewhat surprising, since Travolta (a Scientologist of long standing) bankrolled the entire project. But perhaps it was just as good, since "Battlefield Earth" quickly got the reputation for being *the* worst movie ever made. I suppose Scientology has enough bad media exposure already, LOL. In the end, I give "Battlefield Earth" two stars, but perhaps three-and-a-half for the involuntary entertainment value. Trust me, this will become a classic!